When it comes to installing and uninstalling software in Windows 7, most of us take for granted that we are walked through the process each and every time. Most consumers install a software program through the installer program they downloaded. From there, they follow the steps on screen to install the program. When it is finished, they can begin using the program right away. 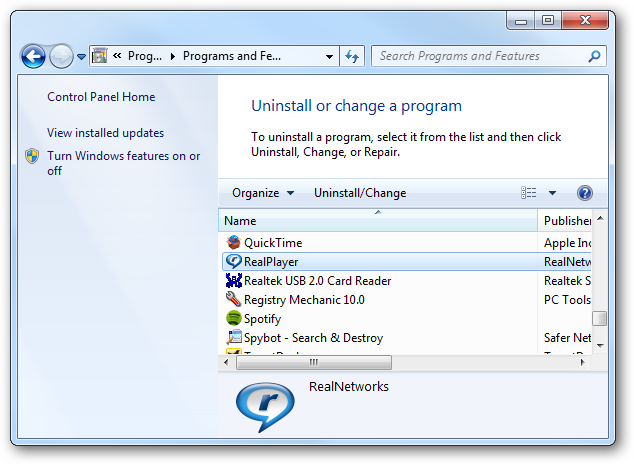 If they opt to uninstall program, many choose to do so through the uninstaller that was installed when they originally started using the program in question. This uninstaller is often found in the folder in the Start Menu associated with the program. Every Windows 7 user should know how to install and uninstall software, this guide will walk you through both processes. When it comes to installing software in Windows 7, you have to be mindful of security. Just because you download something from the Internet does not make it safe. Before you begin the installation process, you want to scan what you downloaded with your anti-virus program of choice. Once it is cleared, you can begin the installation cycle. 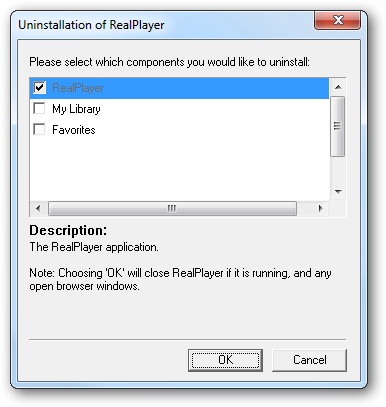 For this guide’s purposes, I am installing RealPlayer onto my computer. 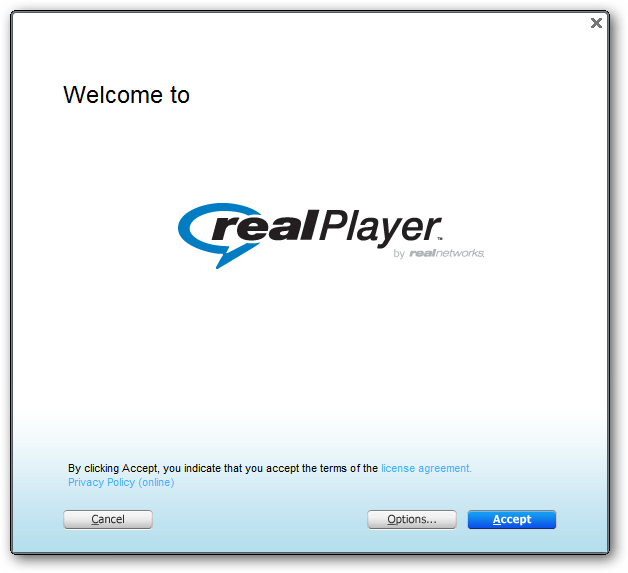 RealPlayer is a media player created by the RealNetworks. It works with MP3, QuickTime, and Windows Media formats, along with its own RealAudio and RealVideo formats. I downloaded the RealPlayer installation file from CNET. Then, I scanned it with my copy of Avira AntiVir Personal anti-virus software. Since it came back that it was safe, I double-clicked on the installer to begin the process. Depending on your Windows 7 security settings, you may be prompted each time you install new software if you want to start the process. This is to ensure that you have downloaded the file from a reputable source. You can disable this warning, but it may be a good reminder to stay safe when installing software. 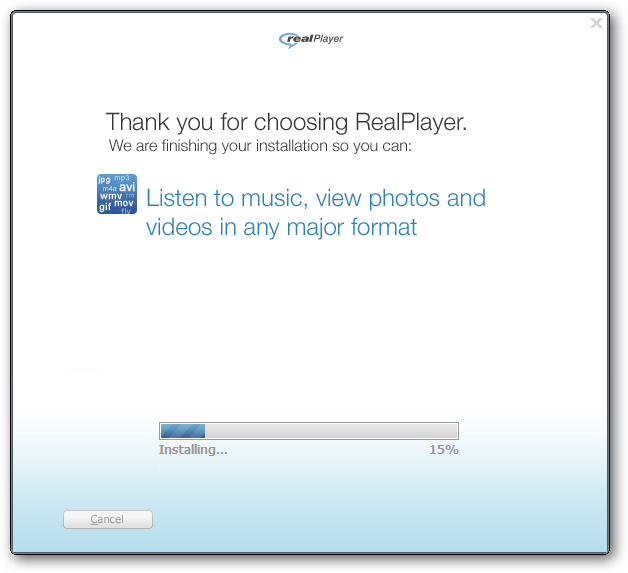 Now, RealPlayer offers its installation opening screen. This will give you a bit of information, maybe the logo and an introduction to the terms and conditions. Some installers will require you to actually read the legal notifications before continuing. In this case, RealPlayer wants me to open the terms and conditions in a separate window. RealPlayer has also set up an “Options” button. I have clicked on it to take a look at what I can customize during this installation. Once I have finished customizing, I have closed the window and clicked “Accept” to continue. 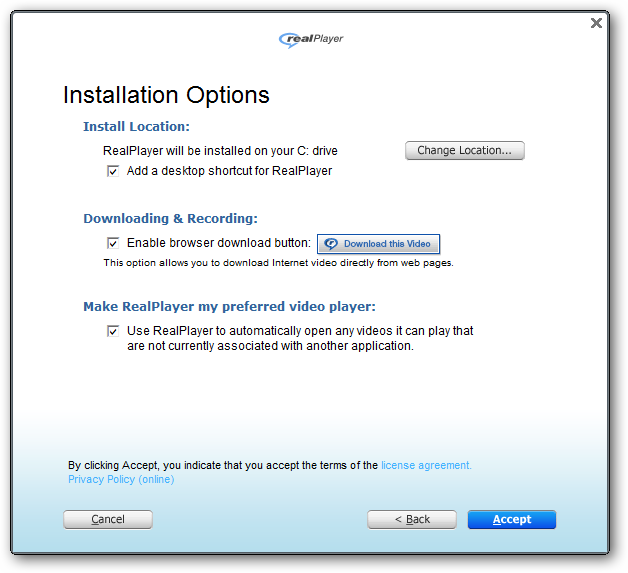 RealPlayer takes a few minutes to install, any software you choose to install will take some time to do so. Just let it do its thing. When it is finished, you will begin to use RealPlayer or whatever software you chose to install. 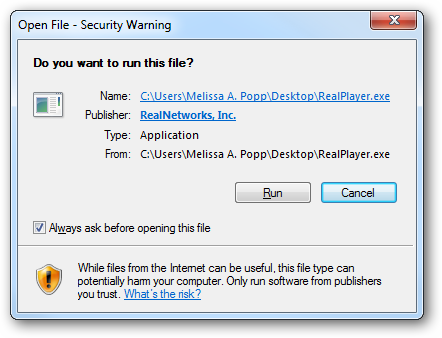 While not all installations in Windows 7 are set up like RealPlayer’s, most of them involve all of the steps in one order or another. Installers will guide you through the process. If in doubt about anything going on, just let it walk you through the steps and customize the options later down the line. If you need to uninstall software in Windows 7, you can do it via the uninstaller that came with the program when you chose to install it or you can do it via the Control Panel. Uninstalling a program this way is something every Windows 7 user should know how to do. 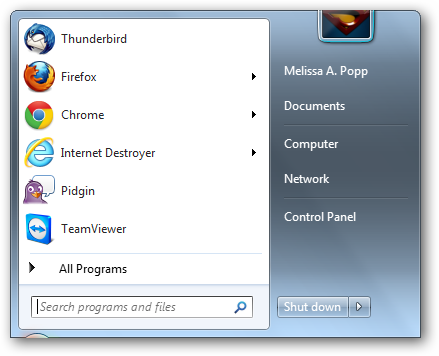 Then, we click on the “Control Panel.” From here, click on “Uninstall a program” under the “Programs” header. We want to scroll through the programs we have installed until we find the one we need to uninstall. In this case, I have found RealPlayer and highlighted it. If I right click on it, I get the “Uninstall/Change” options. 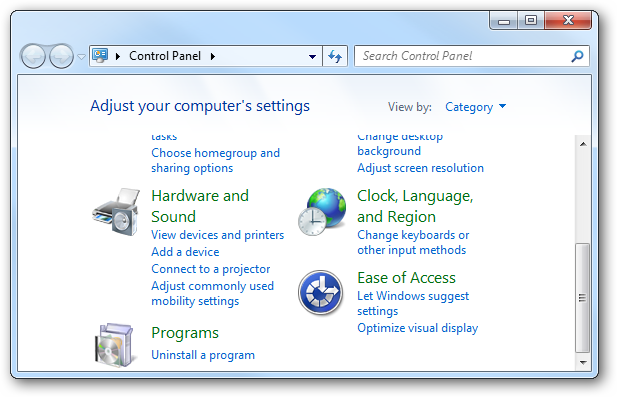 Uninstall removes the program from your computer whereas change can repair a program or add additional functions depending on the scope of the program. Click on “Uninstall” to continue. When you start uninstalling a program, the uninstaller pops up to walk you through the process. If you are uninstalling a program that utilizes data on your computer, it will ask you if you want to delete that as well. Click on what you want to delete, then click “Ok,” “Continue” or “Next” depending on what the uninstaller prompts you with. You will be asked if you are sure about uninstalling a program. Click “Yes” or whatever the prompt is to follow through with the process. Once you agree, the process will begin to eliminate the software from your system. You want to let it run its course. In some cases when software is uninstalled, you must restart your system to complete it. For RealPlayer, that is necessary to delete files that are in use in the background. When you uninstall a program, you want to restart Windows 7 anyway just to make sure the entire process completes properly. Even if it does not prompt you to, it is a good idea anyway. What happens if you have issues installing or uninstalling software? If you have a problem installing or uninstalling software, the first step is to refer to the website the program came from. Often these sites have help guides or forums that will offer advice to consumers having issues during these common processes. If you do not find the information you need, use a search engine like Google to track down more information. Chances are someone else out there is encountering the same problem you are and can give you advice as to what to do next. Rarely do issues pop up when installing or uninstalling the software. If you happen to be one of the few that finds yourself in trouble, just take a deep breath and track down a solution to your installation problems in Windows 7.